Sometimes you need to stand up for yourself, or you're just begging to be taken advantage of. We (Spry Fox) have filed a copyright infringement suit in federal court against 6Waves LOLAPPS in response to their release of Yeti Town, their blatant copy of Triple Town. This was a difficult decision for David and I. We are not enthusiastic about the prospect of spending our time in court as opposed to making games. And in general, we believe that only in the most extreme circumstances should a video game developer resort to legal action in order to defend their creative works — the last thing our industry needs is frivolous lawsuits. Unfortunately, it is our opinion that 6waves has behaved in a reprehensible and illegal manner, and we can not, in good conscience, ignore it. 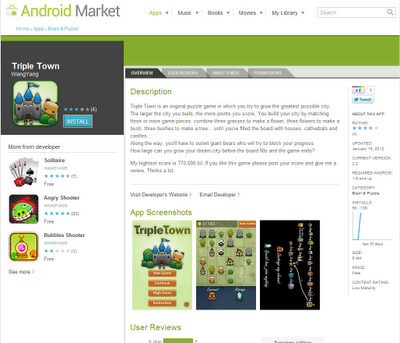 Gamezebo: "Unfortunately for Yeti Town, the only substantial difference between it and Facebook’s Triple Town is the platform it's on. Otherwise it’s the exact same game, only this time with snow." InsideSocialGames: "Yeti Town is a matching game nearly identical to Spry Fox’s Triple Town"
Games.com: "Replace "saplings" with "bushes", "tents" with "houses" and "yetis" with "bears". What do you get? Something that would look a lot like independent developer Spry Fox's Triple Town"
Second: what most people don’t know is that 6waves was in confidential (under NDA) negotiations with us to publish Triple Town at the exact same time that they were actively copying Triple Town. We gave 6waves private access to Triple Town when it was still in closed beta, months before the public was exposed to the game. We believed those negotiations were ongoing, and we continued to give private information to 6waves, until 6waves’ Executive Director of Business Development sent us a message via Facebook on the day Yeti Town was published in which he suddenly broke off negotiations and apologized for the nasty situation. His message can be found in its entirety in the body of our legal complaint. It’s bad enough to rip off another company. To do so while you are pumping them for private information (first, our game design ideas, and later, after the game was launched on Facebook, our private revenue and retention numbers) is profoundly unethical by any measure. Despite all this, David and I still struggled with the idea of initiating a lawsuit. However, 6waves brought the issue to a head when, rather than openly and honestly discuss their actions, they had the chutzpah to tell Gamasutra that they had developed Yeti Town completely independently, and characterized the legitimate public criticism of their company as simply “part of the natural process” of game development. We believe that there is nothing “natural” or ethical or legal about 6waves behavior. What they did was wrong. And if they get away with it, it will simply encourage more publishers to prey on independent game developers like us. We refuse to sit back and let that happen.